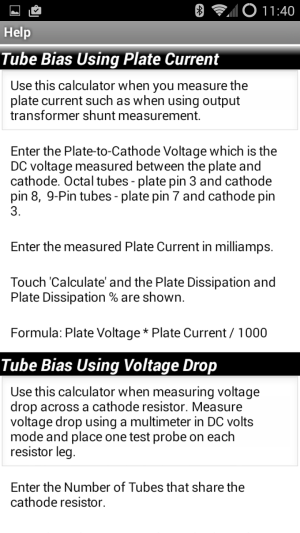 The Tube Bias Calculator© is free and available here in the Google Play Store. I have been told that some anti-virus software is flagging the Tube Bias Calculator as "potentially harmful." 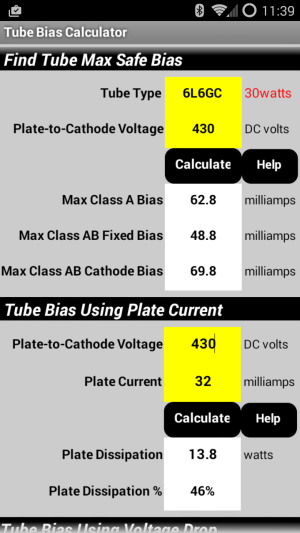 The Tube Bias Calculator was created using MIT's Appinventor 2 programming environment and some anti-virus programs will flag anything created with it. You can Google "appinventor 2 virus" and see it is a common problem. If this happens to you I assure you that my Tube Bias Calculator does nothing but calculate tube bias. WARNING: A tube amplifier chassis contains lethal high voltage even when unplugged--sometimes over 700 volts AC and 500 volts DC. If you have not been trained to work with high voltage then have an amp technician service your amp. Never touch the amplifier chassis with one hand while probing with the other hand because a lethal shock can run between your arms through your heart. Use just one hand when working on a powered amp. Take your amp to a tech if you are not trained to work with high voltage. See more tube amplifier safety info here. Enter the values in the yellow boxes and touch the 'Calculate'button. Find your tube in the selection list. After selecting the tube the tube's maximum dissipation rating is shown to the right of the tube box. Enter the measured Plate-to-Cathode Voltage (voltage between the plate and cathode tube socket pins). 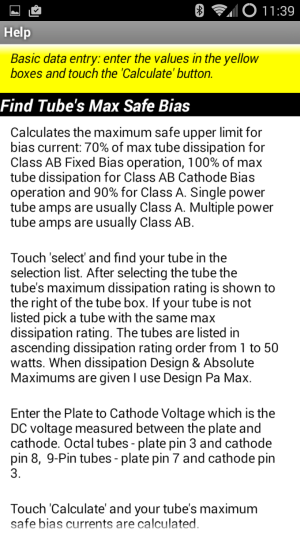 Touch 'Calculate' and your tube's maximum safe bias currents are calculated. Single power tube amps are normally Class A. Multiple power tube amps are usually Class AB. Touch the 'Help' button to open the help page. Enter the Plate-to-Cathode Voltage which is the DC voltage measured between the plate and cathode tube socket pins. For octal tubes pin 3 is the plate and pin 8 is the cathode. For 9-Pin tubes like the EL84 the plate is pin 7 and the cathode is pin 3. Enter the measured Plate Current in milliamps. Touch 'Calculate' and the Plate Current, Dissipation and Dissipation% are shown. Enter the Number of Tubes that share the cathode resistor. Enter the Voltage Across the Cathode Resistor (voltage drop). To measure voltage drop across a resistor set your multimeter to DC volts and put one meter probe on each resistor leg. 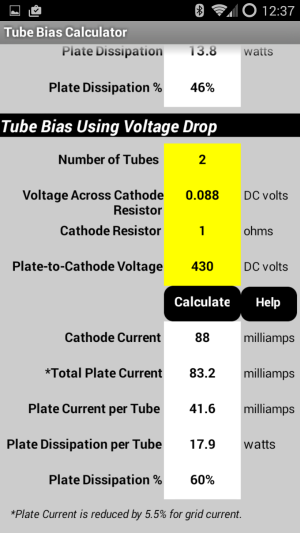 Enter the Cathode Resistor resistance in ohms. Enter the measured Plate-to-Cathode Voltage which is the DC voltage measured between the plate and cathode tube socket pins. For octal tubes pin 3 is the plate and pin 8 is the cathode. For 9-Pin tubes like the EL84 the plate is pin 7 and the cathode is pin 3..
Touch 'Calculate' and the Total Cathode Current is calculated. Total Plate Current is Cathode Current minus a 5.5% screen current. Divide the Total Plate and Current values by the Number of Tubes and you get Plate Current, Dissipation and Dissipation % per Tube. If you prefer working with spreadsheets here's my Tube Bias Spreadsheet for Excel and OpenOffice.